Once upon a time there was a great king, named Agamemnon. He was the ruler of Mycenae, and the greatest ruler among the princes of Greece. He and his brother, Menelaus, married two beautiful sisters, Clytemnestra and Helen. More noble Greek blood was shed on account of these two women than ever before and after. Menelaus and Agamemnon met their brides, the daughters of King Tyndareus in Sparta. Their father, King Atreus, had been murdered by his twin brother, Thyestes, and Thyestes’ son Aegisthus. (I am leaving out all kinds of really rotten things that went on between these two. Some things just aren’t all that edifying, even if it is Greek mythology. Plus, I am doing a bit of pseudo-propaganda here so that you will pull for Agamemnon, and appreciate the story better. Is this censorship? You bet!). These two creeps ruled Mycenae with an iron fist and banished Atreus’ hated sons to Sparta. After Agamemnon and Menelaus grew up and married, Menelaus eventually inherited the throne of Sparta from his father-in-law, and then he helped Agamemnon chase their wicked uncle and cousin out of Mycenae. Agamemnon established himself as a just, though filthy rich, ruler. (He was more than a bit egotistic, but that doesn’t figure into this story so much. Sheesh. Just pick up a copy of the Iliad, why don’t you? Or do a quick read on Wikipedia. And let me finish the stinkin’ story already!). Some time after their marriage, a Trojan named Paris showed up in Sparta and took Helen back home with him. Menelaus was outraged, and using his brother Agamemnon’s persuasive political clout, they mustered an army from all of Greece and set sail for Asia Minor. So began the Trojan War. Ten years it lasted. The best, most courageous and noblest of the men of Greece were buried on Asian soil. Troy, the jewel of Asia, was burned to the ground, (it took seven years for the last, smoldering ember to die). Finally, the princes of Greece divided the spoils, loaded them onto their ships, mourned the dead one last time, and made the journey home. The wrath of the gods fell upon many of them. Some of them never reached home, but were plunged to the depths of the Achaean Sea. Others, like Odysseus and Menelaus, journeyed long years on the surface of the deep, blown far off course in their desperate pilgrimage. Fortunate Agamemnon returned home with few adventures on the way. Aegisthus? What was he doing back in Mycenae? And why should he be so happy for Agamemnon to come back home safely? But his wife looked (and felt!) beautiful, and he could smell the banquet-fare cooking somewhere nearby. It was good to be home. He would have hard questions for Aegisthus later. Today was a day of joy. A few hours later, Agamemnon and his men were reclining around a table, making merry. Life was good. His beautiful wife, Clytemnestra, lay against his chest. The equally beautiful Cassandra reclined behind him. His men raised their cups to him time and time again, long into the night. As the oil in the candles began to exhaust itself, he gazed at his wife, beckoning her to bed. Her responsive stare was disconcerting. A wicked smile was played across her face. Suddenly, a sharp stab of pain tore through his chest, and he looked down to see the point of a sword, coated in his own blood, protruding through his right breast. 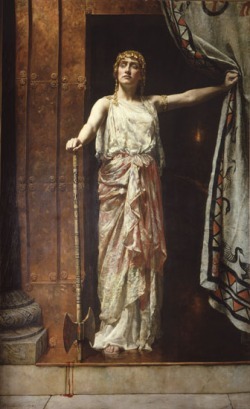 He turned to look back at Clytemnestra, but she was no longer in her seat. He heard Cassandra screaming behind him, and rolled over to see his treacherous wife plunging a knife repeatedly into his lover’s breast. His sight began to dim, but he could see Aegisthus gloating above him, and hear his men being slaughtered all around him. He stretched out his hands towards Clytemnestra, hoping to grasp her and work some act of dying vengeance, but she kicked them out of her way as she rose from Cassandra’s corpse and gave his old foe a bloody embrace. Darkness absorbed him and his soul was dragged down to Hades. So ended Agamemnon, hero of the Trojan Wars.